For more than 25 years, the attorneys at the law office of Carluzzo Rochkind& Smith, P.C. have helped couples take proactive steps in the drafting of prenuptial agreements in Manassas, Prince William, Manassas Park, Gainesville, Haymarket, Woodbridge, Lake Ridge, Dumfries, Bristow, Warrenton, Centreville, Fairfax, Stafford, Chantilly, Leesburg, Ashburn, Sterling, Herndon, Reston, Alexandria, Annandale, Arlington, and throughout Northern Virginia. While considered the most non-romantic aspect of planning a wedding, protecting your interests comes first in the crafting of a prenuptial agreement. Another important factor in the drafting of a prenuptial agreement is the lawyer you and your soon-to-be spouse retain. A prenuptial agreement requires careful preparation. It is not a document thrust upon a bride or groom to sign before a wedding starts. 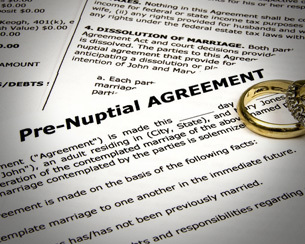 A prenuptial agreement can also ease the divorce process should the couple decide to split. It spells out property division/debt upon separation, spousal support and other issues common to formally ending a marriage. For help with a prenuptial agreement, call us at 703-361-0776 or fill out our online intake form to schedule a free initial consultation.